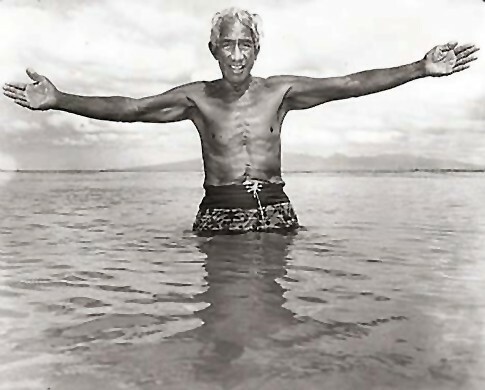 Honorary Duke Kahanamoku "1994 Surf Pioneer"
Duke Paoa Kahinu Mokoe Hulikohola Kahanamoku was born on August 24, 1890 in Honolulu Hawaii. The Duke had five brothers and three sisters, including Samuel Kahanamoku. Kahanamoku spent his youth as a bronzed beach boy at Waikiki Beach where he developed his surfing and swimming athleticism. 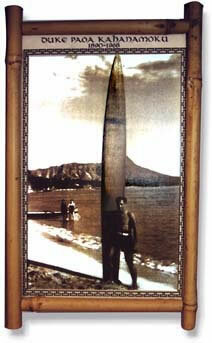 He is singularly credited with popularizing surfing world wide during the 1920’s. Springboarding off his 1912 and 1920 Olympic swimming fame, this record breaking champion brought his 10’ redwood plank with him in his many travels and drew large crowds to his “performances”. 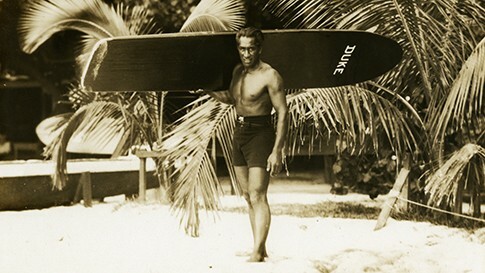 First to challenge the North Shore’s gigantic waves with style and ease, the Duke became an inspiration to young and old who then wanted to take up surfing. Loved by all, his many credits include starting the first surf club (Oahu 1907), voted Sheriff of Honolulu 13 times, made Official Greeter for Hawaii and establishing the first world wide surfing contest (The Duke Kahanamoku Invitational). When he died on January 22, 1968, at the age of 77 from of a massive heart attack, his funeral was the biggest Hawaii had ever seen. Thanks to the efforts of dedicated individuals from the Huntington Beach International Surf Museum, the commemorative U.S. postage stamp became a reality after a letter campaign and lobbying were met with success. 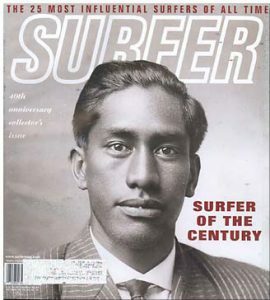 On August 24, 2002, the 112th anniversary of Kahanamoku's birth, the U.S. 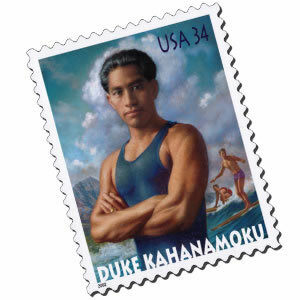 Postal Service issued a first-class commemorative stamp with Duke's picture on it. The First Day Ceremony was held at the Hilton Hawaiian Village in Waikiki and was attended by thousands. At this ceremony, attendees could attach the Duke stamp to an envelope and get it canceled with a First Day of Issue postmark. These First Day Covers are very collectible. 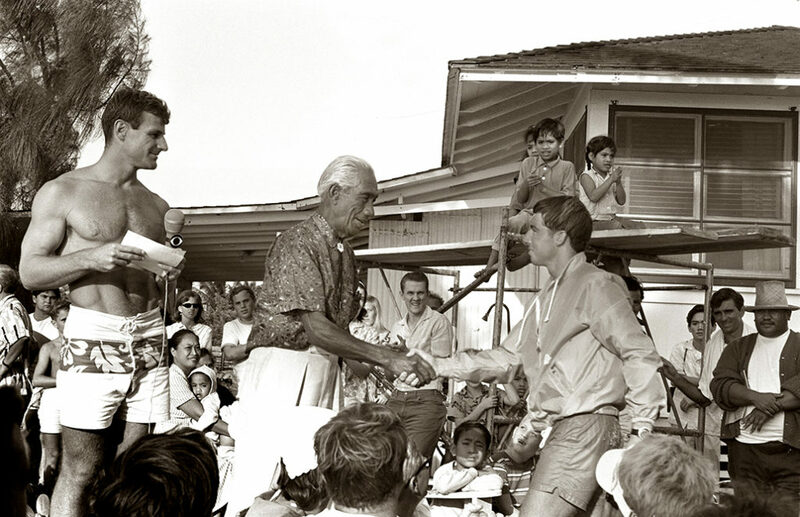 PHOTO: December 14, 1965 Sunset Beach Hawaii, awards for the first Duke Contest. Left to right Fred Van Dyke, Duke Kahanamoku. Shaking hands is Felipe Pomar, from Peru, the third place winner. Photo courtesy Leo Hetzel.